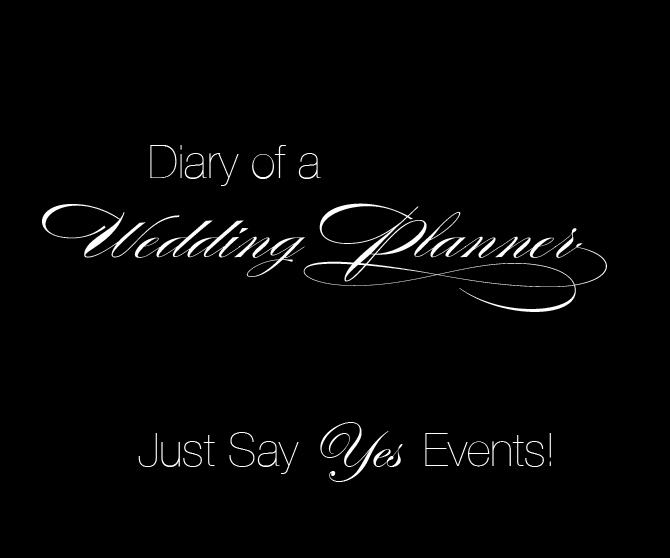 Just Say Yes Events: Venetian Wedding Rehearsal. Venice has always had a special place in my heart! Last year My fiancee and I spent three weeks in Europe visiting over a dozen different cities including London, Paris, Versailles, Marseilles, Venice, Florence, Rome & more! The moment we arrived in Venice I was in love! I remember looking out from our Juliet balcony looking onto the canals seeing my very first gondola and thinking I never want to go home! Hah....If my fiancee would have left me I would have stayed there forever. I now understand why Venice has inspired so many artist as it completely got my artist mind going. 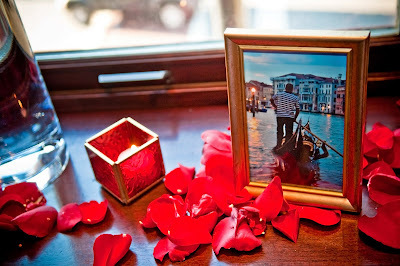 When it came time to plan our own wedding I knew from day one that I wanted a Venice inspired wedding rehearsal. The wedding itself had a very modern feel with clean lines and a black and white theme so I wanted a completely different look. The wedding rehearsal was hosted at our "First date" restaurant The Chicago Firehouse on Michigan Avenue in Downtown Chicago. The restaurant means a great deal to us and knew it would be perfect for the rehearsal of our wedding. Daniel's parents graciously gifted the rehearsal to us and we wanted to blow them away with decor and make it extremely special. The color scheme we selected was a luscious red *Grooms favorite color, small touches of purple*Grooms mothers favorite color and gold accents of course! 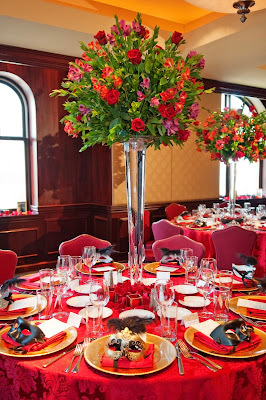 The tables were a covered in a luxurious heavy satin red damask linen that matched the existing chairs in the room. To break up the red on the table and the napkin that was also a satin red we used gold chargers at every place setting. In each napkin was a menu for guests and on top my favorite part...... 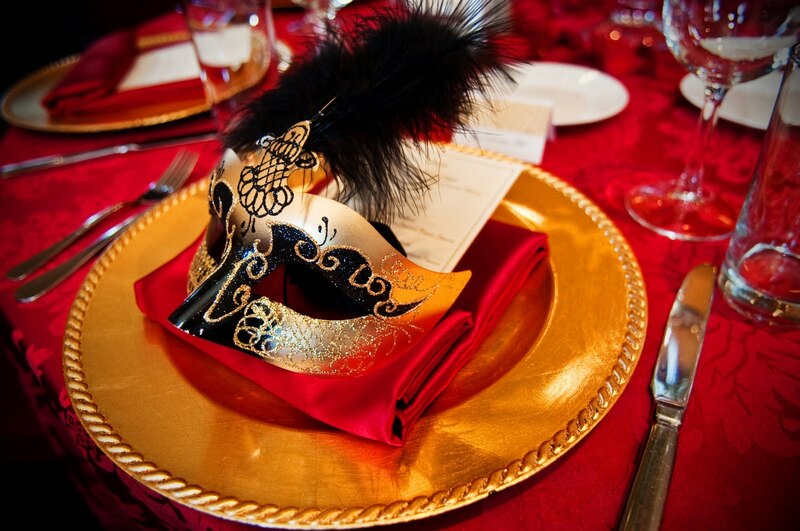 Authentic Venetian masks gilded in gold and silver with feathers of course! The masks brought back so many memories for me and I was very excited to give them to our guests. For the centerpieces I knew they had to be grand as everything in Venice is very over the top. 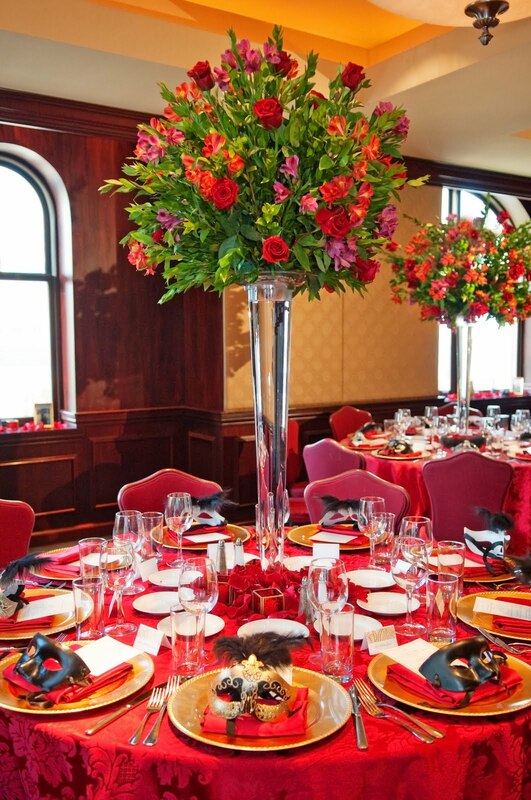 The centerpieces were tall 30" Pilsner vases with a huge floral arrangement atop the vase. All together with the vase and the arrangement the height reached over five and a half feet composed of two different varieties of red roses, alstromeria & greens. 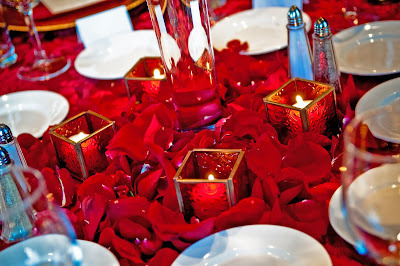 Around the base of the centerpieces were gorgeous Venetian inspired votive holders in red glass with golden edges and tons of rose petals. When designing an event I think of all aspects of the rooms itself so the room looks cohesive and there are no areas that look odd. During one of the last visit to The Chicago Firehouse with the wonderful Christine Picerno who was fabulous I noticed the windows had rather large ledges. The designer in me starting thinking up ways to decorate the ledges and make them more welcoming as they are rather large. 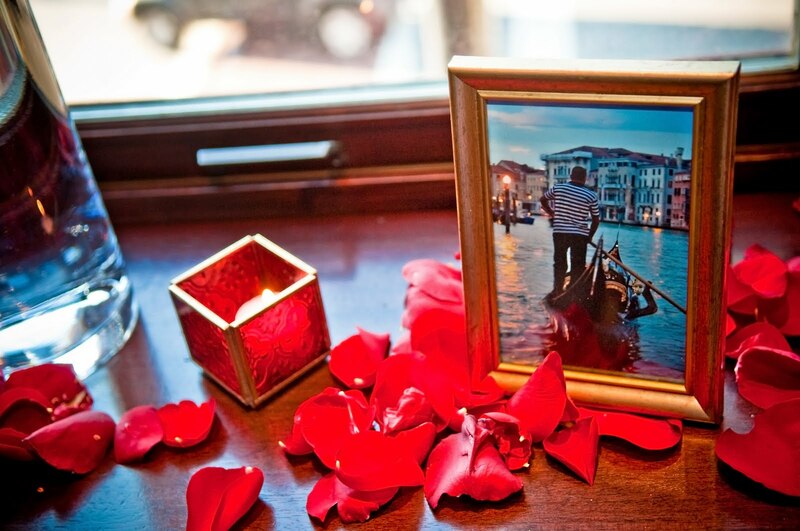 I came up with the idea to display images from our trip to Venice in gold frames which meant a great deal to me. I did not want the frames to just be alone and so I added tons of cylinders with floating candles and hundreds of red rose petals with the frames. There are a few details that I just have to mention! Daniel wore red sock to match the theme of the evening and I wore a gorgeous silver satin dress with heavy ornate beading and ostrich feather strap keeping within the theme. Daniel's parents also created little notes thanking everyone for coming and included photos from our engagement photo-shoot inside. They sealed the envelopes with hand dripped wax seals and a little M for Mouradian. They were a very nice surprise and something we will cherish forever. I would also love to give a little shout out to our great friends over at Carasco Photography!! 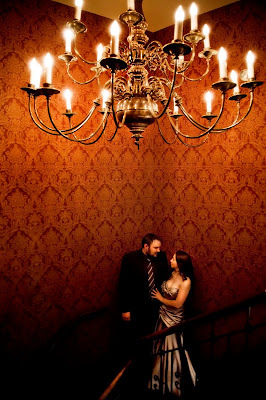 They did the photography for the rehearsal and we couldn't be more pleased. They captured the look we were going for and we have memories that we will cherish forever!